If you follow me on Instagram, you'd know that I have a new hobby. Along with blogging, writing for MQ, chasing a toddler, and simultaneously baking a baby girl, I have taken up embroidery. Not old fashioned hoop and needle (although I would love to learn someday) but I've entered the world of computerized monogramming and it is quite an obsessive hobby. I have been toying around with purchasing an embroidery machine for a few years and finding out we were having a daughter really solidified my decision to buy one. I love anything and everything monogrammed and figured I would be doing a lot for our baby girl. It was an easy sell on my husband whose hobby is fixing up old cars... this is a hell of a lot cheaper! I've had a lot of emails asking about my machine and what supplies I have so I figured a blog post would be the easiest way to get the word out. After chatting with a few other women who have machines and doing quite a bit of research myself, I purchased a Brother PE770. I wanted the highest rated but lowest priced machine that fit a 5x7 hoop. I have a friend who has a machine that will only use a 4x4 hoop and she wishes it was larger...this is exactly why I like to use recommendations from friends before purchasing! 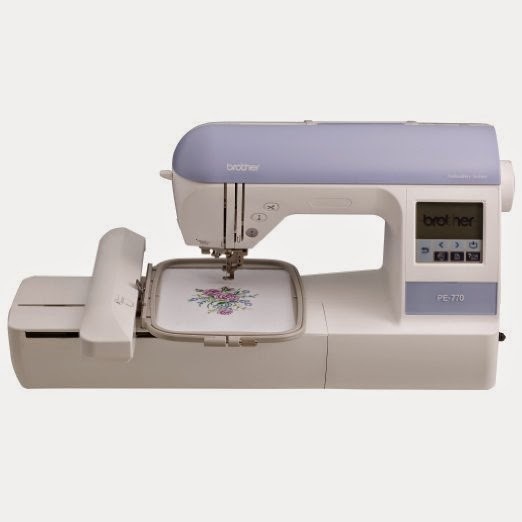 This machine was top rated on Consumer Reports and Brother is such a recognizable brand. I actually bought my machine on Overstock.com after receiving a 10% off coupon for signing up for an account with a new email address. I price shopped for a while since it is a hefty purchase, and that is the best deal I found (and I wanted brand new, not refurbished). The night my machine came in I expected to be monogramming Lucy's entire wardrobe within an hour. Boy was I wrong! Is it easy for me to do now? Yes. But easy is NOT a word I would use to describe learning how to use it. Lots of prayers, frustration, and tears...yes I can get emotional about crafting. I joke with people and say that this is the gift that keeps on taking because I've had to buy quite a few essentials to get it up and running. If you are looking into buying an embroidery machine, here is what I have in my stash. Brother 4x4 hoop- my machine came with a 5x7 hoop which I am glad to have the capability to do but most of my projects are baby items so I bought this 4x4 hoop and use it 90% of the time. Embroidex thread set- instead of purchasing colors on their own, I bought this set and haven't not had a color when needed. So far I like this thread, it shreds when I'm working with super thin fabric so I think I will test out some other brands but I love how inexpensive it is! 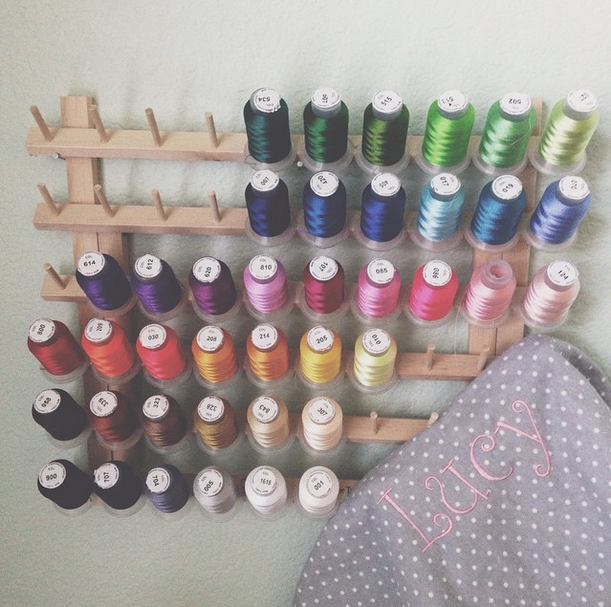 Wooden thread rack- I have this hanging on the wall above my machine and the thread is in color order. It's really nice to be able to see all of my options and have quick access to it. Pre cut tearaway stabilizer sheets- you must use a stabilizer backing on each project and to save time and space, I prefer pre cut sheets. It tends to be more expensive than buying a roll but this is a great deal. I also have the same sheets for my 5x7 projects. I have a roll of cutaway stabilizer that I bought from JoAnn fabric but I don't use it much. Spray adhesive- instead of hooping my projects I float them with a spray stabilizer and it is SO much easier! Super solvy- for thick fabric items (towels, fleece), using a topper stabilizer makes the embroidery look so much better, and not flat. It's water soluble so dissolves when you wash it but I just peel it away after I am done. Bobbin thread- I use white bobbins instead of winding one for each color of thread I have and use this thread. You can also buy prewound bobbins and these come highly recommended (make sure you buy the specific size for your machine). Embroidery software- my machine came with preloaded fonts and designs but I can honestly say I will never use any of them. You can purchase tons of fonts and designs on Etsy for as little as $1 but you must have software to load into your machine. I purchased Sew What Pro (works best on a PC) for $65 and am able to create my designs on my laptop, load onto a USB, and pop into my machine. You can get a free 30 day trial before buying. Embrilliance software comes highly recommended for Mac users but I have no experience with it. Fonts and designs- like I said above, there are TONS of fonts available for purchase online. I have purchased a few from different shops on Etsy but my favorite is Rivermill Embroidery. You can follow them on Facebook for coupons too. My machine takes PES files only so be sure to purchase the correct file format. I am 2 months into this embroidery gig and loving it. If you know me at all, you know I love thrifting, especially for baby clothes. 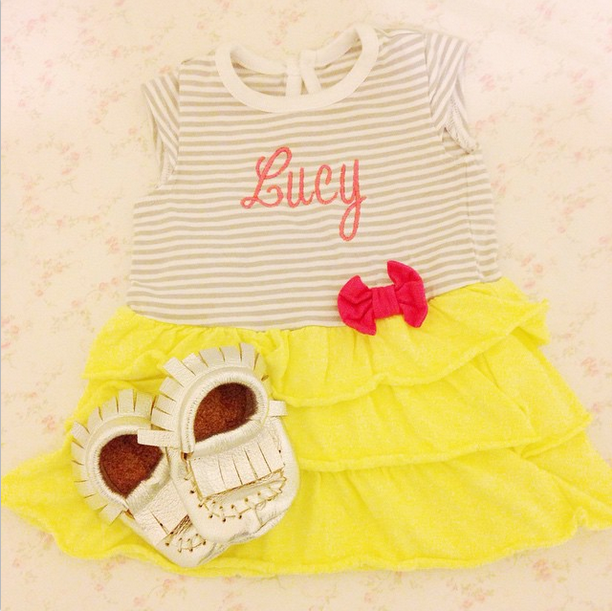 I've bought tons of outfits for Lucy for less than a dollar and stitched her name on them, easy peasy! I have done a few gifts for friends and items for family but mostly just playing around with things for my babies. Doing a project can take a good chunk of time (creating the file in Sew What Pro, loading into my machine, and the actual stitch can take a while) so I am not sure if I will offer up my services anytime soon. I did my first fleece lovey a few weeks ago and my first backpack this week! It's fun to experiment and I am proud of myself for actually reading the manual and figuring this machine out. If you are interested in buying a machine of your own or have any questions, shoot me an email! Well we are LESS than 3 months away from meeting our Lucy girl. I can't remember if I wrote this in my last update but we have our C section date. Our girl will be born on Monday April 27th, 2015 at 7:30am. That was a surreal phone call to get from the hospital and we are very excited! Jon and I talk about how crazy it is that we will just have a normal weekend and bam, have a baby on Monday. In case you missed the post, I shared why I am opting for a repeat C section (read here). I will be 27 weeks on Saturday and these were taken, via lovely iPhone (sorry baby #2) last Saturday right at 26 weeks. People who haven't seen me in a while comment on how big my belly is getting and it's true! According to my home scale I have gained 16lbs. I just looked at my weight chart for Ford and at 28 weeks I had gained 20lbs, so very similar, I do, however, feel smaller this time around. The past two weeks have been rough, physically, thanks to sciatic nerve pain. I had it here and there with Ford (but mostly back pain because he was so large), but it is terrible with Lucy. The only relief I can get is laying down on my heating pad so there have been a lot of tears, back rubs, essential oils, and other attempts to relive the pain. It has been better the past few days but carrying around a gigantic toddler doesn't help. I've also had some random hip pain, I guess my body thinks it needs to prepare to pop a baby out down there... no sir! Heart palpitations are back with a vengeance and hard to manage. A few times a day my heart just races and I feel like I just ran a 5k, even if I have been sitting on the couch for an hour. Down to 1/2 a Zofran pill at night only, yeah! I tried to skip it a few times and ended up having to wake up in the middle of the night to take it. That is okay with me because I like not vomiting :). I filled a prescription of 20 pills this week so I am optimistic that it will be my last refill. Despite the back pain, I have been to the gym about twice a week the past 2 weeks and that feels good! I am not really doing cardio anymore because of my hips but light weights and I did 30 min of a Zumba class this week (that was interesting ha!). The weather has been wonderful in Austin so we've been trying to walk everyday. My next appointment is a week from Monday and I have my glucose test. I had GD with Ford and am really hoping I don't have it this time because sweets are my weakness. In the end, it's not a big deal to give them up and I loved having a big ole baby but pregnant cravings are real! We've done lots of things in the nursery and can't wait to show you! The room was painted last week and I've spent the last few weeks gathering things for the walls which we hope to hang up soon. Ford now loves going into Lucy's room and playing in there. Even though I have an anterior placenta, I feel her all the time and so does Jon! We even see her move outside my belly which is pretty cool. 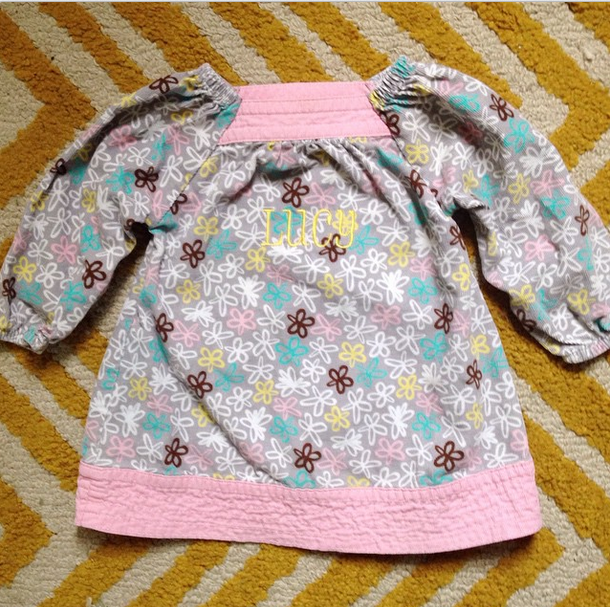 I went to Dallas last week and came back with a ton of baby girl clothes and swaddles for Lucy from cousin Embry. I did some major nesting and washed all of her clothes and organized by size, put away larger sizes in storage, folded the rest, and put them in drawers. I love being ahead of the game and most of all... organizing. One of the greatest inventions in this day and age is online shopping. And it's even better when you're a mama because the thought of going to try on clothes while my toddler pockets anything in sight and RUNS away from me with a big ole' smile on his face sounds (and is) miserable. These days you can even order your groceries online from your neighborhood grocery store and have them to your doorstep within an hour. So...why spend time digging through racks of clothing at Forever 21 only to realize their dresses are basically crop tops and their jeans are sized for pre-puberty girls. Shopping for clothes online is such a blessing because I can see outfits styled on people who actually know a thing or two about fashion and imagine that one day I'd be able to recreate. Shopping online is fun but shopping on Instagram... whole new ball game. You scroll through your feed in the morning and jealousy sets in as you drool over Saturday morning donut breakfasts and guilt settles in when you see photos of ladies at the gym with a glimmer of sweat dressed head to toe in adorable Lululemon gear (who can afford those get ups anyway?!). Then... you scroll to the latest post from Berkeley Blvd. and now you feel good. Berkeley Blvd. is an online clothing boutique started by one of my girlfriends Brandi that offers affordable, high quality, trendy but not your main stream cookie cutter look clothing items for women. You may remember my slouch cardigan in this post, it was from Berkley Blvd. and oh so comfortable! 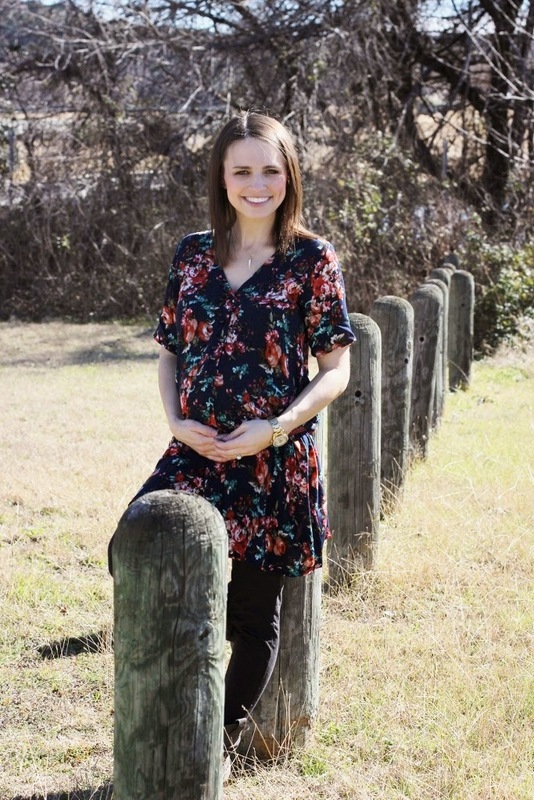 My second pregnancy is in a totally different season than before so it can be tricky to find tops that outfit my growing belly, without having to invest in an entire new maternity wardrobe. This dress from Berkeley Blvd. fits the bill and I look forward to wearing it this summer, sans leggings, with strappy sandals without the pregnancy waddle. 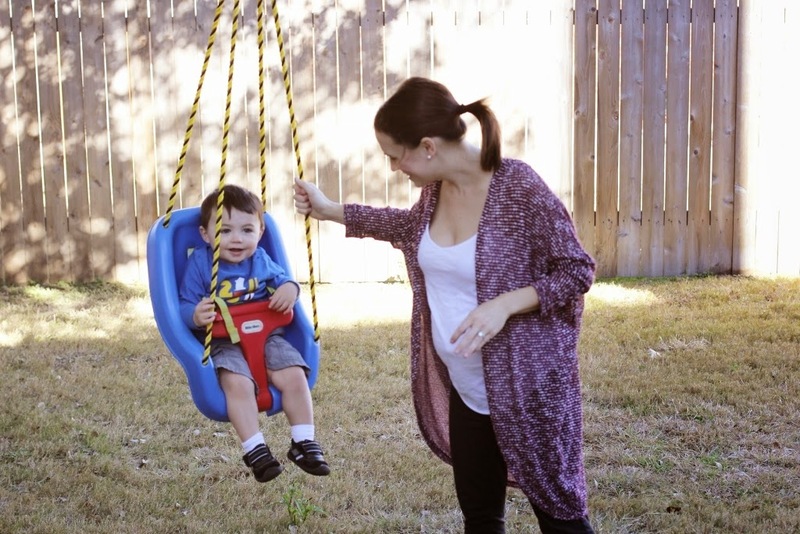 It is light, comfortable, and well made...the top three requirements for "cool mom clothes". And it's only $34 with free shipping all the time in the US! Do yourself a favor and follow @ShopBerkleyBlvd and you'll be shopping right from your phone! Use the code RUTHIE for 20% off your entire order! Ford came out looking like my clone but he is so much like his daddy, it's rather hilarious. Jon grew up an only child of a single mama and became an "adult" rather quickly. His brain was always moving, exploring, and learning. Ford is nowhere near adulthood status but he has Jon's brain, a little engineer. Ford has always been the little guy at the playground who will climb all the way up to the top on his own and instead of coming down the slide, will stay up there for 5 minutes touching all the nuts, bolts, and screws, and looking through peepholes. 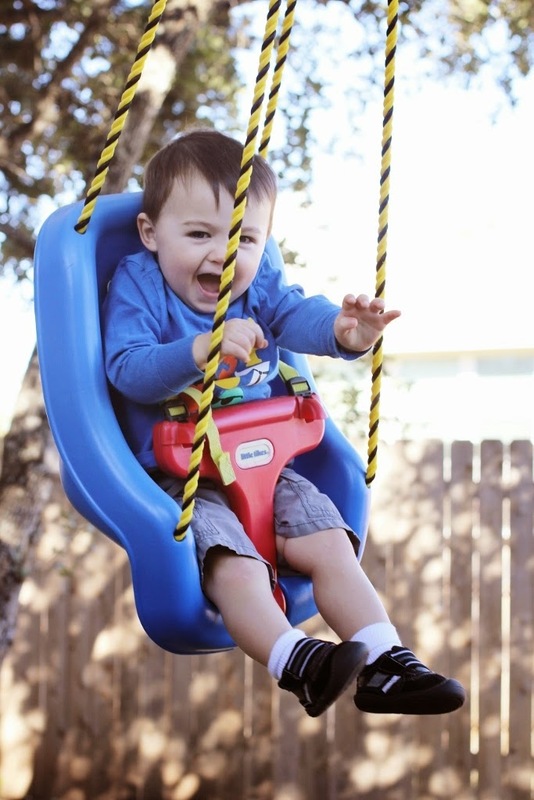 Actually, as of last weekend he will go down ANY slide at the park, this is huge for him! He wants to figure out the best way to get somewhere, how to manuever small spaces, and making things go off and on or left and right. You can imagine one of his favorite things to do is play with light switches and appliances. We took him to an awesome children's museum when we were visiting Chicago and he could have spent 2 hours in the "light room". 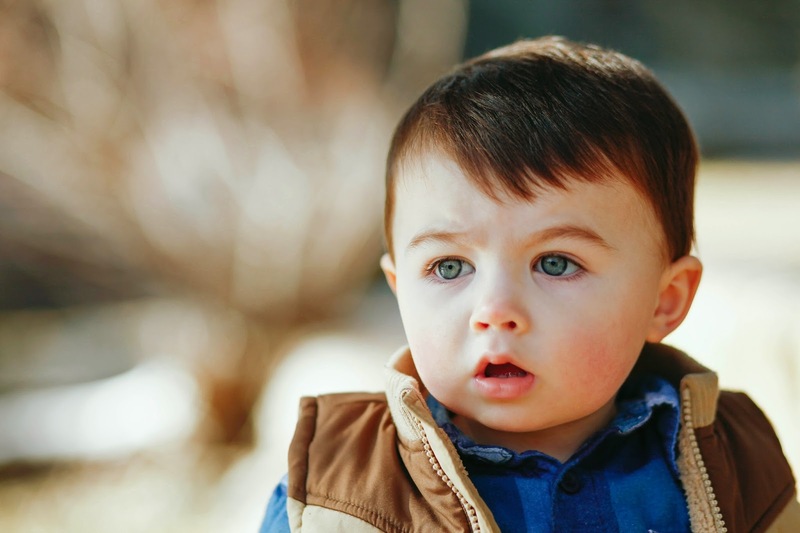 He gets major satisfaction from seeing a problem solved and has this determined little look on his face when he is figuring stuff out, the funniest furrowed brow. As of lately, puzzles are his favorite because he can mess them up and put them back together. He also doesn't like to get dirty, a kid after Jon's heart (no pun intended). I put leftover yogurt with the spoon in the fridge last week and tried to give it to him a couple hours later and he whined because the spoon was dirty and got his finger dirty. He finds microscopic little particles, feathers, and rug wool around our house and announces that they go in the "tash". It is hilarious because I am pretty sure I was a sassy little free spirit at his age. It's so neat to see how quickly baby's personalities shine. 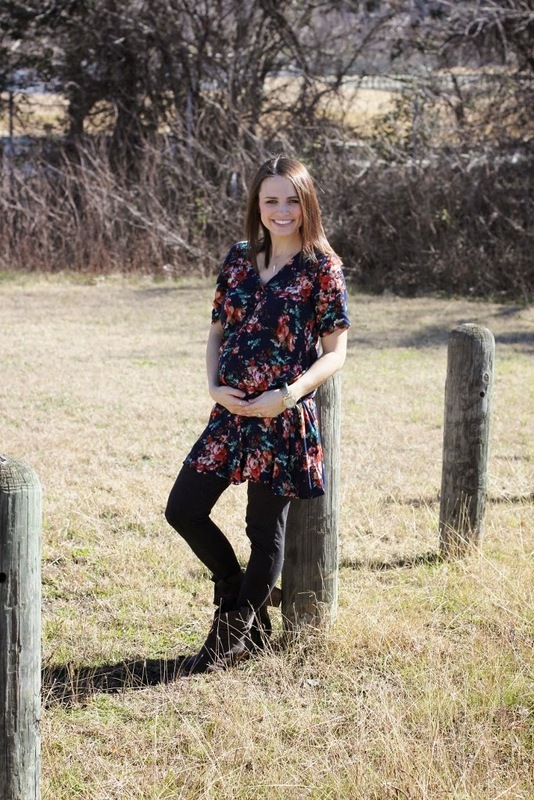 Last weekend we had the pleasure of working with Mallorie Owens (who will be doing our maternity and newborn pictures so soon! 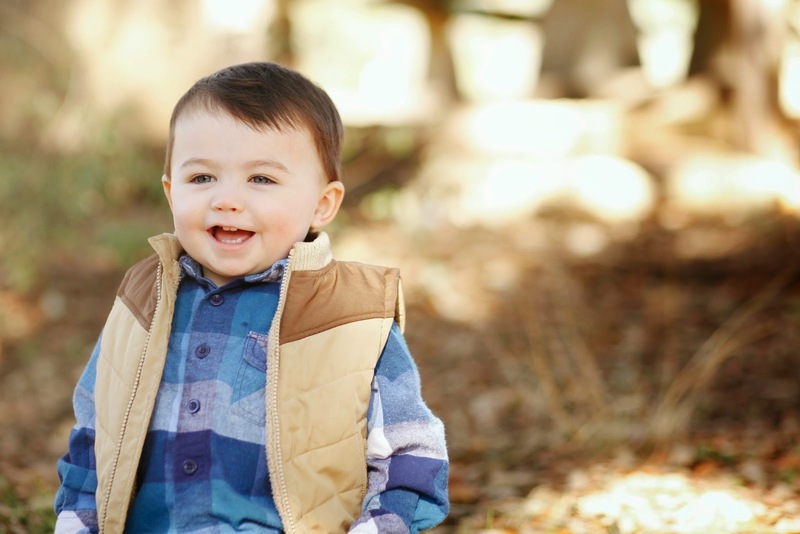 ), to snap some "18 month" photos of Ford. 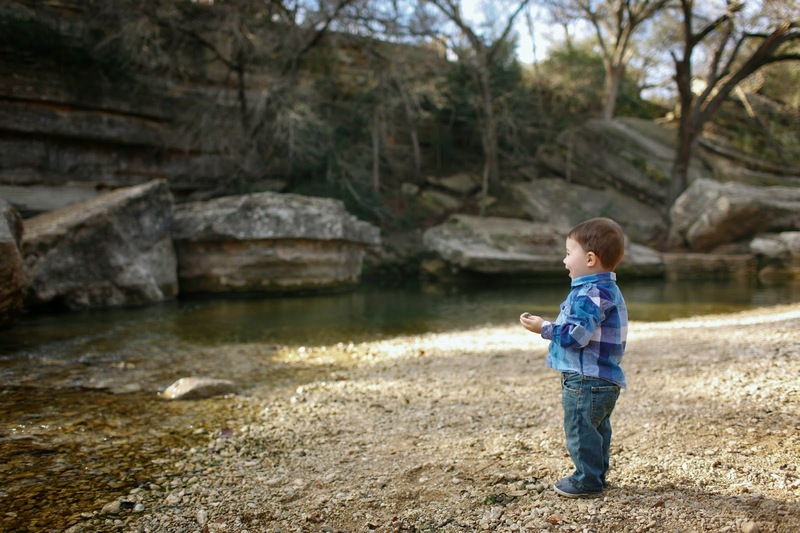 We spent the morning at Bull Creek Park and basically just followed Ford from area to area where he examined rocks, collected leafs, and ran his little heart out. Such a little boy. 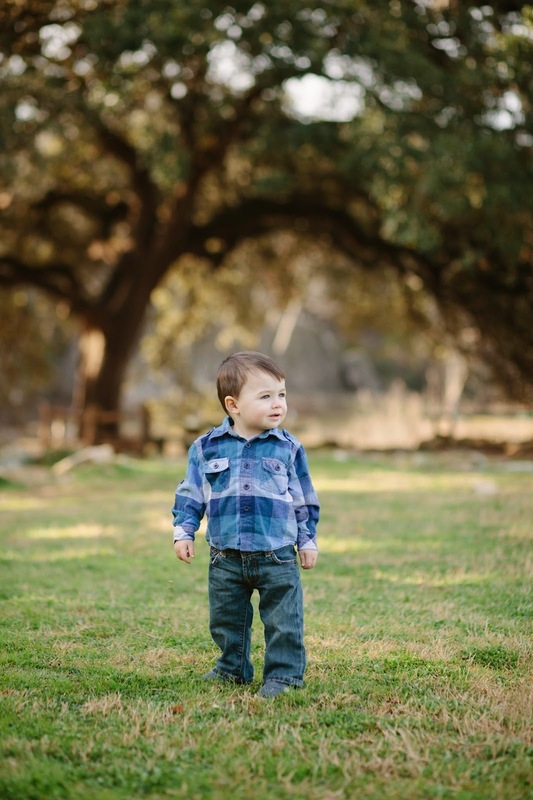 Mallorie and her hubby just moved to Austin from Alaska so contact her if you need spring photos of your family or little ones! Jon and I are in a smore season right now. We go through phases of being obsessed with certain foods, namely desserts, and right now it is post dinner/post baby bedtime smores in the microwave by the fire. Jon has perfected the method and we like to experiment with different mini candies instead of just plain ole' chocolate. 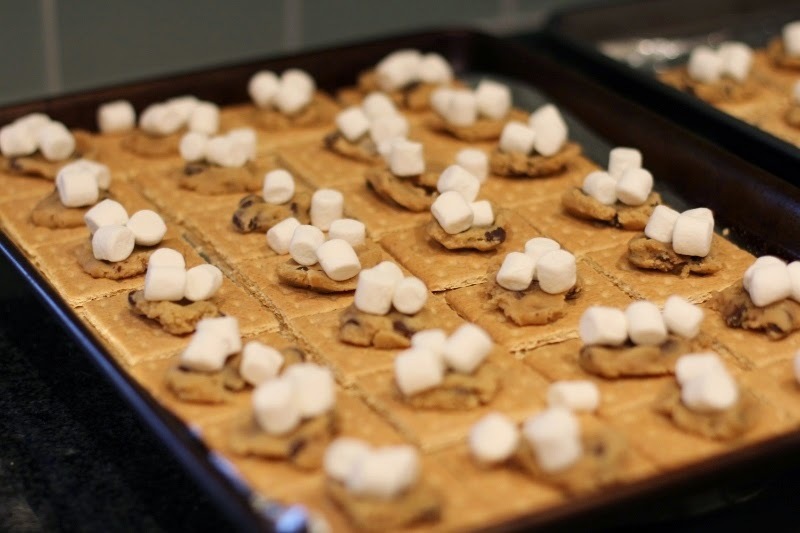 I got the genius idea to search smores on Pinterest (this goes great with my plan of not eating as many sweets as I did over the holidays) and it was heaven. 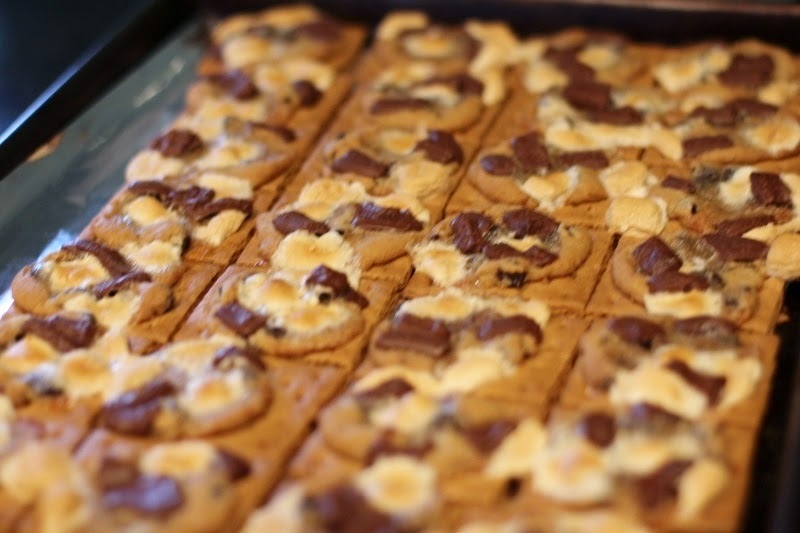 I got the idea for these smore cookies from this recipe, made it my own, and boy are the GOOD. This weekend was good, oh so good! 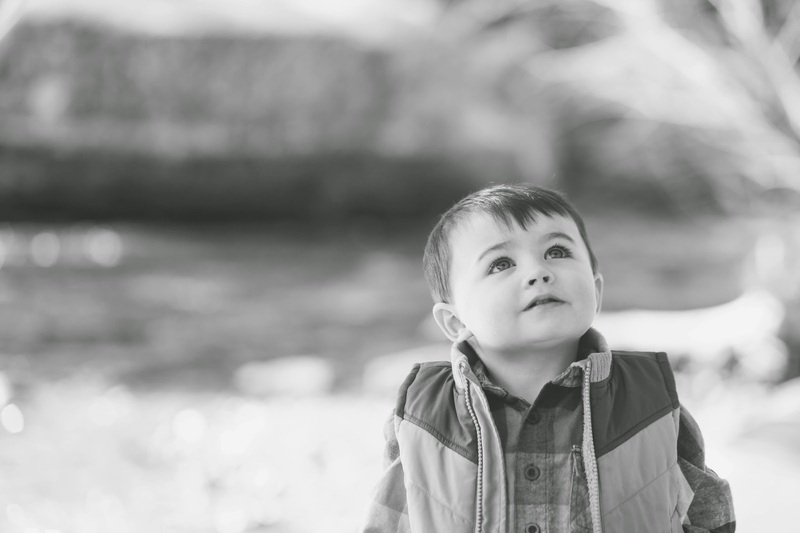 We took Ford's 18 month photos, went to a birthday party, and did some little projects around the house but the best part was the weather. Yes I am an old lady who could talk about the weather for an hour. I want to know what the weather is like where my sisters are and where my out of state family is, and the weather has a huge effect on my mood. 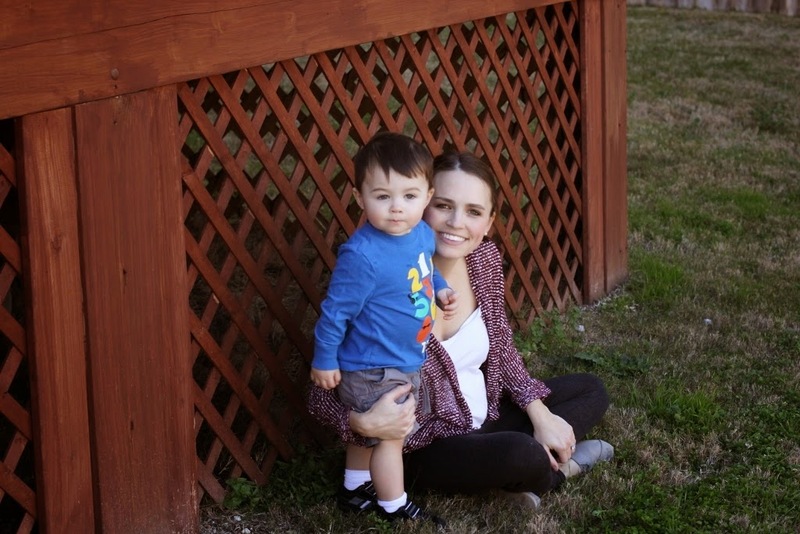 We had lots of family time and spent a good chunk of the weekend outside basking in the sunny January temperatures. 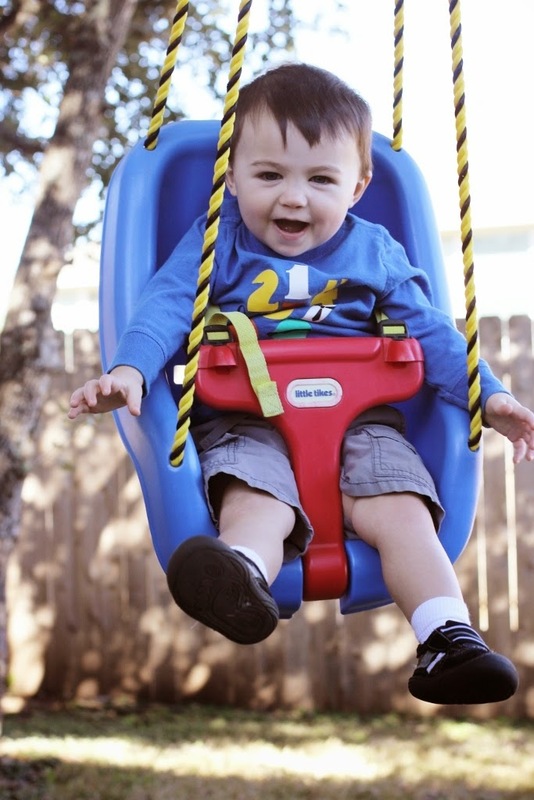 We set up Ford's new soccer goals, went to the park, and did lots of swinging. Ford has always been very verbal but I feel like in the past week his speech has exploded. He said "Mama, wing!" 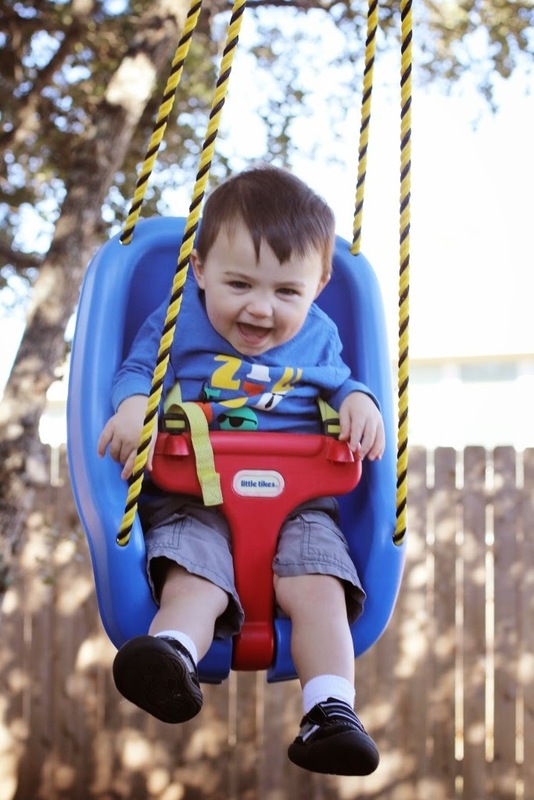 and ran right over to his swing, I was so glad Jon snapped these photos because Ford had the time of his life. Watching him have fun is just the best. It makes me forget the fact that he says "NO!" with such attitude lately and has perfected the face-in-his-hands-against-the-wall pout. He's always been Mr. Play It Safe at the park and has now conquered the big slides on his own. It is such a joy to watch him discover things for the first time and watch him be brave and get proud of himself (he has no problem with self confidence haha). 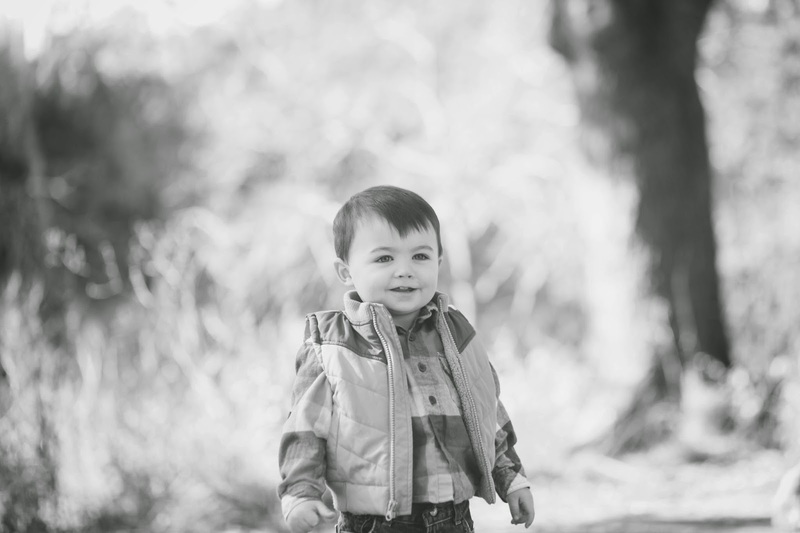 I loved watching him run around the yard and park this weekend and his chubby cheeks still jiggle with baby fat. 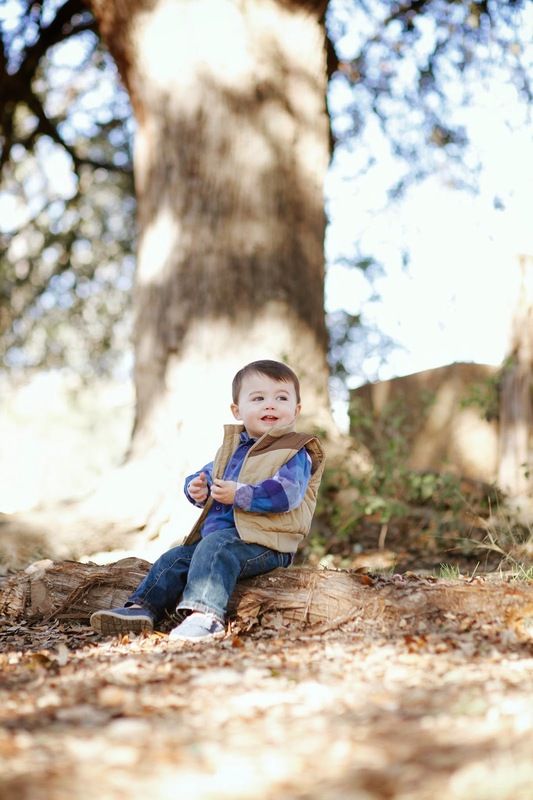 I want to bottle up these memories and keep them forever (and somehow chemically remove the sassy toddler moments). He now asks for "hulp hulp" when he needs help doing something, I kind of love that. He also noticed the elephant tattoo on my foot while we were in the shower last night. He took his hand and started making an elephant sound and wouldn't take his eyes off of it. I need to come up with a story about why mama's foot "stamp" won't come off. I realize I am rambling and this post isn't really about anything but last night looking through these pictures made me feel so full and happy. The countdown for baby Lucy's birth is on and if I am being honest with you, I am terrified at the thought of loving Ford any less. 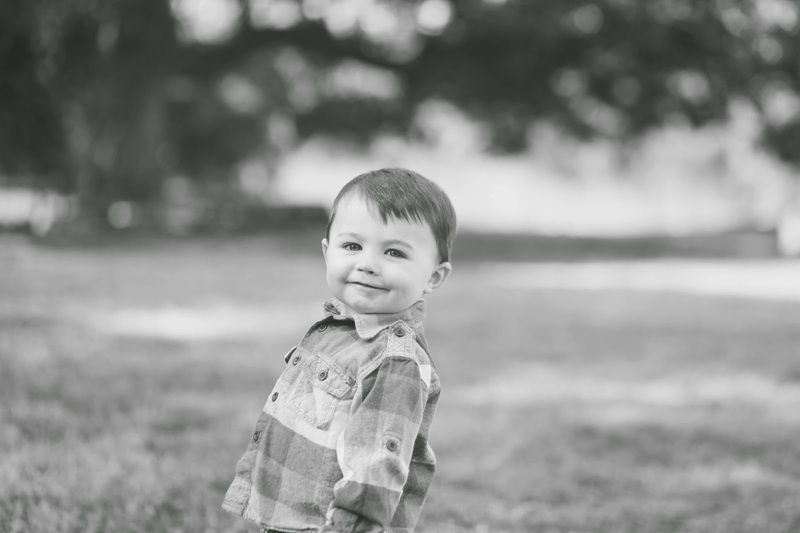 I know, I know, that won't be the case at all....my heart will grow and make MORE room to love her but right now I am pouring my heart into this little boy of mine who has me wrapped around his dimpled little finger. 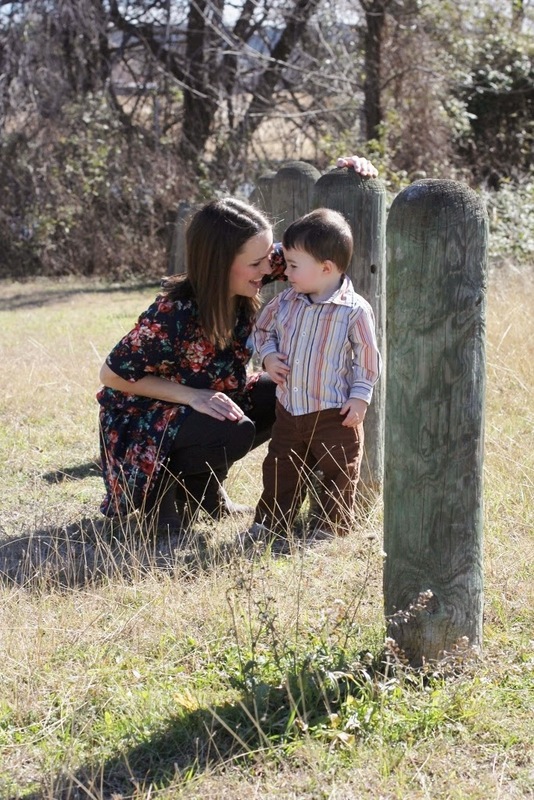 Oh how I love him so (and his daddy too... that husband of mine is A plus). I almost forgot to mention my new slouch cardigan from Berkley Blvd, an online shop started by one of my sweet Austin turned DFW gal pals, Brandi. 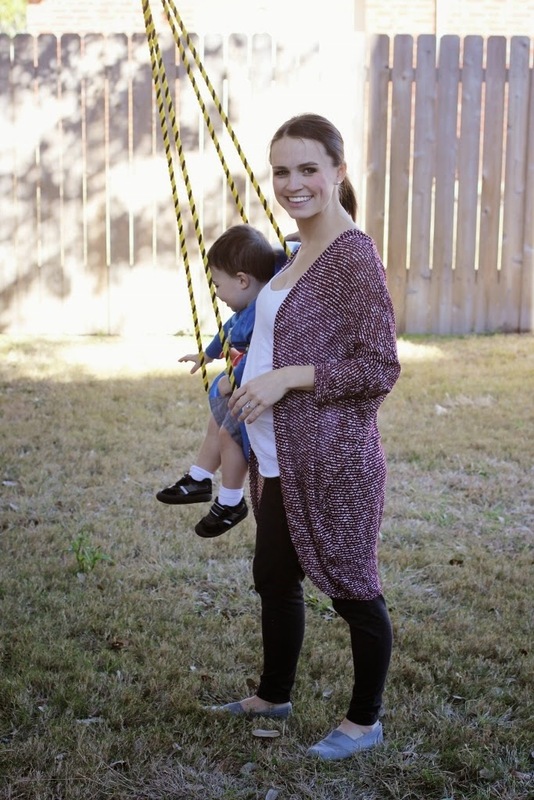 I can't wait to show you more pieces I have in my closet from Berkley Blvd but in the meantime, hop on over to their website and get your hands on one of these cardigans (it makes my stay at home/also pregnant yoga pants and t shirt wardrobe seem fancy!). Use the code RUTHIE for 20% off your entire order! 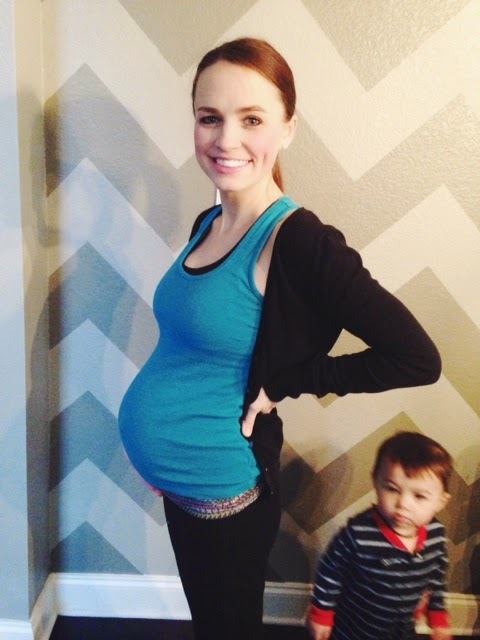 How I did weekly updates when I was pregnant with Ford, I don't know! Bump pictures have been scarce around here thanks to wearing the same pajamas for days on end and not brushing my hair for the same time frame. So we are having a baby this year! Holy smokes. I was very emotional on New Year's Day partially because I woke up with the tummy bug but also realizing how quickly our family would be welcoming in little Lucy. I kept saying, "oh yeah after the holidays we will do XYZ" and that time is now! The nursery is in full swing, I can't wait to show you guys the progress, and my belly is getting large and in charge. It still amazes me how the human body stretches and grows. I have quite the appetite lately...not really any certain cravings or aversions, just very hungry! To the average person my belly button looks adorable and popped like any other pregnant lady but my hernia is pretty protruding. I am anxious to get it repaired when L is born. We had our anatomy scan yesterday where they take about 45 minutes to measure every single part of her body and everything looks great! We saw all 4 chambers of her heart, 2 kidneys, tummy, healthy placenta/cord, and more. It was such a fun appointment and they turned on the 3D quite a bit. Our stubborn little lady had both of her hands AND one foot over her face the whole time so getting a face shot was tricky. The tech was able to remove a little of her hands but she wants to keep us surprised with her good looks. She is measuring in the 50th percentile and has the sweetest chubby cheeks. Overall feeling really good but feeling big. Grow baby grow! 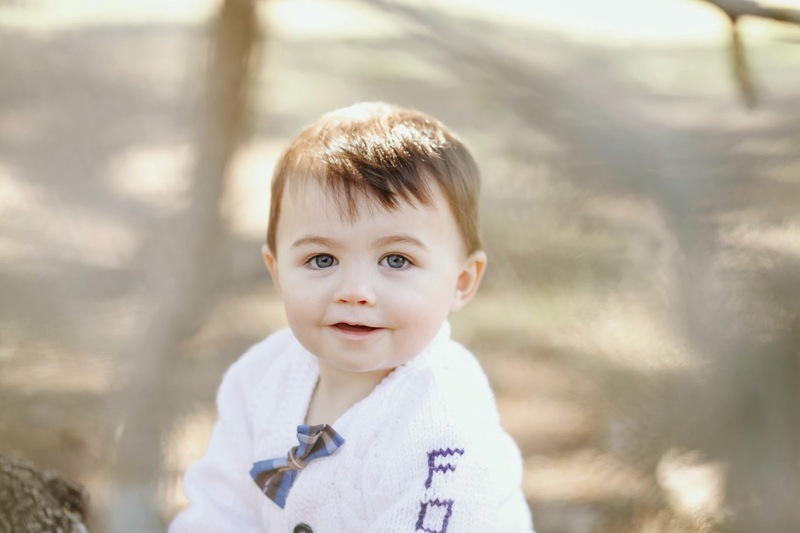 Our little doodle bug is 17 months and I am holding onto the last few moments I have with him as my baby because next month he will be closer to the age of 2 than 1. Tears. 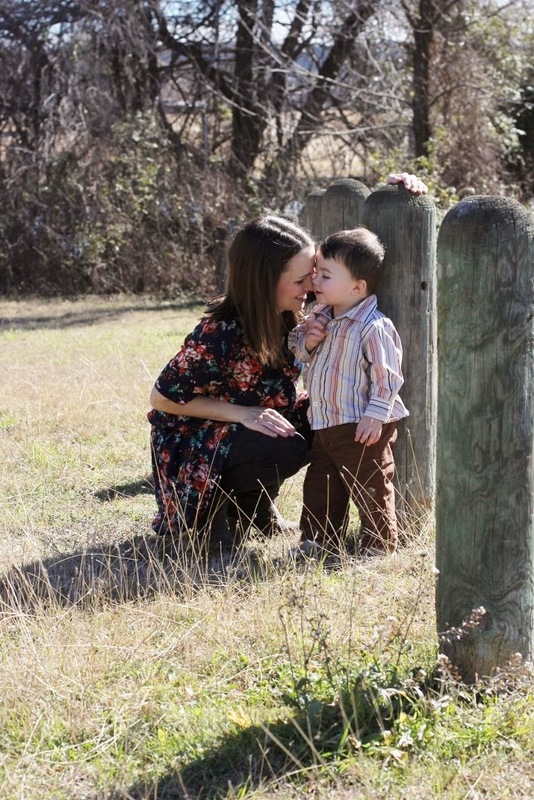 Speaking of tears, we had a lot of them the past month thanks to a plague of sickness that infected our whole house. Rough stuff, y'all. But we are on the ups, Ford is sweet, happy, smart, and loves life. We love life with him! Basically had the flu but tested negative- high fever, nasty cough, cold, no appetite, lethargic, ear infection. Yuck. Luckily he loves amoxicillian...aka "candy". Talking all the time, repeats anything we ask, very chatty. Sees himself in the mirror and says "me!" Loves helping me clean and put things in the trash, "tash!". He gets out sponges and paper towels and will wash the floors and cabinets, I love it because he is learning to be helpful. He knows a few shapes- star, heart, circle and recognizes them in books, puzzles, and out and about. Can do a few of his chunky Melissa and Doug puzzles on his own (animals, shapes, transportation). He gets very proud of himself when he does it! Obsessed with his new kitchen and grill. We bought this one second hand and he could spend hours cooking and grilling. Becoming quite the perfectionist like his dad. He was "making" me a burger in his kitchen and Jon helped him stack all the toppings to bring over to me on a plate. As he was walking over, the whole thing fell on the ground and he got very sad and embarrassed. He pouts now. If you tell him no or we have to leave somewhere (mimi and papa's), he will run into the corner and put his head in his arms. Little toot. He asks about different family members and people who aren't with us at the time. I will ask him questions like "Ford do you have hair?" and he will answer me but also ask "Mimi? Papa? Daddy? Bug?" Loves playing rough with Ernie and rolling on him/flipping over him. Poor Ernie, I feel bad for dogs with toddler siblings but he is so tolerant! Getting less picky, phew. We gave him ketchup for the first time and now he enjoys a few different meats dipped in. Says "baby" and finds my belly and gives it a kiss. He got a baby doll for Christmas and feeds her bottles and pats her back and says "shhh"
Knows the difference between hot and cold, either "hot" or "brrr"
I assumed that I wouldn't need much when I got pregnant with baby #2. Ford s almost 17 months and it feels like yesterday that my Jon and I were setting up a baby shower registry, putting together everything from baby swings to video monitors, and patiently waiting his (overdue) arrival. Boy was I wrong! 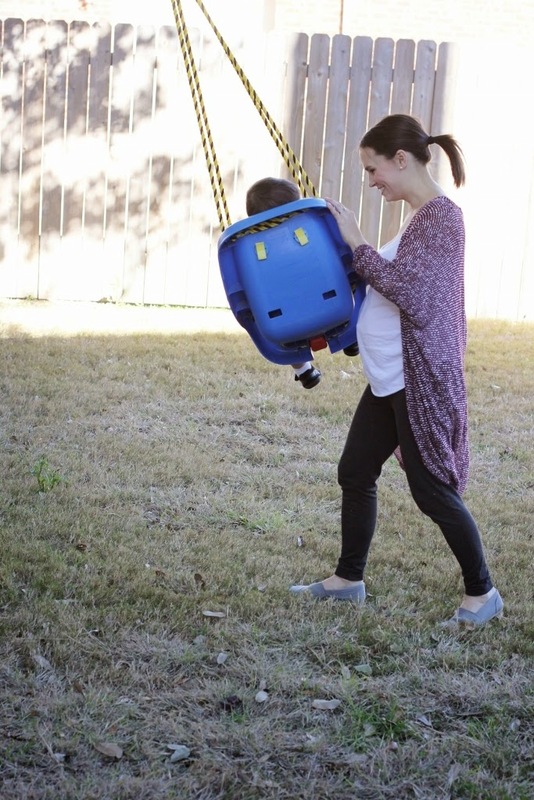 Sure, my house is equipped with lots of baby gear but I have a list a mile long of things I wish I would have had with baby #1, things I didn't like that I had with baby #1 and want to replace for baby #2, and then things I need two of. Lucy will be here in a little over 3 months, cue panic attack. Buying baby girl clothes is a no brainer...I don't mind her using Ford's infant carseat, bassinet, or swaddles but girlfriend is getting her own wardrobe! Speaking of baby girl's wardrobe, I need to put myself back on that "no buying baby clothes" freeze that I was one last week. Whoops. Target does it again. So what is on my baby #2 wish list? I am glad you asked! 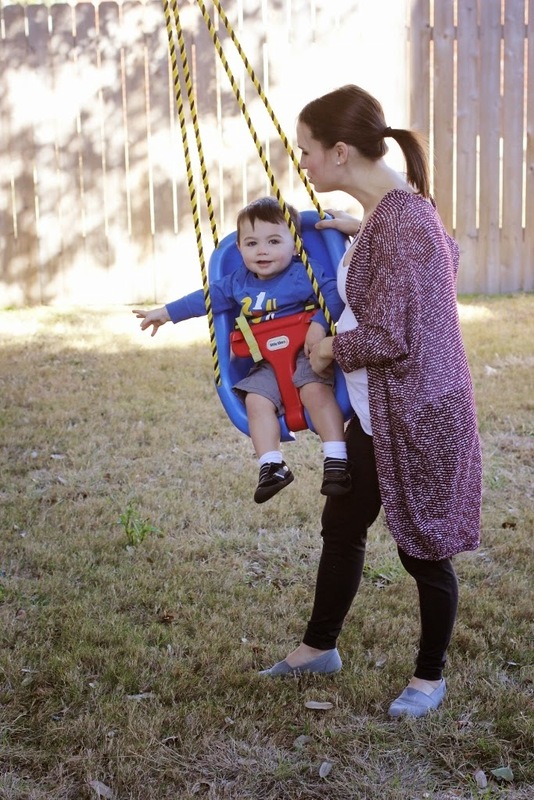 Medela Pump in Style: I received an Ameda Purely Yours pump completely free through my insurance before Ford was born and I was pumped about it, no pun intended. I never had an issue with my supply until it came to pumping. Luckily (if you want to call it luck), Ford never took a bottle so my pumping days were short lived but I truly believe it was the pump that caused my lack of milk. I used a friends Medela once and pumped 3x my normal. It is just a better quality and more efficient which is a requirement since I won't have all the time in the world to sit around and pump with 2 kids! Luckily I found one for an incredible deal and already got it. We plan to implement bottle feeding into our everyday routine with Lucy so she isn't as stubborn as Ford. K'Tan: We are definitely a baby wearing family and the Ergo and Boba has saved the day many many times. I hated the newborn insert for those carriers and was stuck trying to figure out how to tie the 100feet of my Moby wrap in the 100 degree weather. I wore it twice and gave up. 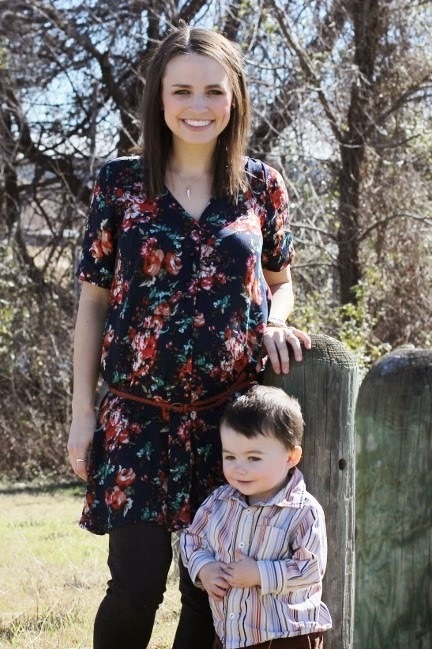 I have been hearing great things about the K'Tan and Solly Baby Wraps and plan on borrowing from my mommy friends! They are supposedly lighter weight than the Moby and so much easier to secure. I foresee lots of baby wearing next summer while at the pool, park, out and about with both babies. City Select Double Stroller: Ford absolutely loves walks in his stroller and we love taking them as a family and with friends so there was not a doubt in my mind that I wanted a good double stroller. I didn't want a double wide after hearing horror stories about them being to wide to fit through doorways and after lots of research and recommendations from friends, I went with the City Select. I bought it here and have yet to put it together. I love that it can be a single or double stroller and that the babes will be able to face each other, me, out, etc. Video monitor: Thank God for video monitors! Ford slept in our room for the first 4 months of his life and my goal is to cut that in half for Lucy. Her room is upstairs so it all depends on how quickly I heal from surgery and how quickly I can get her to 1 feeding a night but that's my ultimate goal. We love our Summer Infant Video Monitor but anytime we use it next to my sisters identical one, it craps out, so we want to get a different brand. After some good research, I found this Motorola one but will also have my eyes peeled for a highly rated monitor for cheap. CR Gibson Baby Book: We have the most precious CR Gibson baby book for Ford and want to get one for Lucy. I plan on documenting her monthly progress on my blog just like I do for Ford but I love hand writing in milestones and memories. 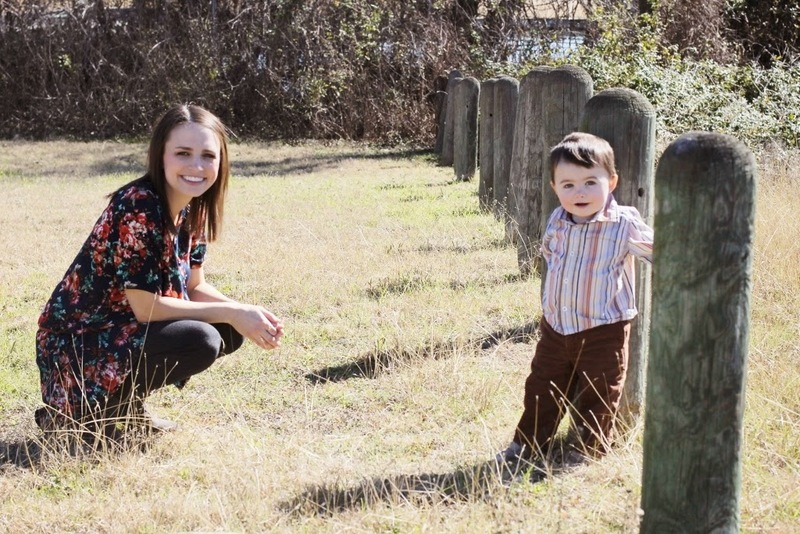 My mom did a great job with my baby book and I want to do the same for my kiddos. Here is the one we are hoping for. Bum Genius Diapers: I currently have 24 Bum Genius 4.0 diapers in my stash plus 3 other branded cloth diapers and want to add a few more. We started cloth with Ford at 8 weeks and if we did the same with Lucy, Ford would be around 23-24 months. Recently Jon has been doing lots of research on potty training early and we plan on trying next summer but if it doesn't work out, we are fine with two in diapers. We shall wait and see. All of my diapers are gender neutral and I would love to add some girly colors to my stash! I've actually had a few friends ask if I have created a registry and I hadn't planned on it from the beginning but made one on Amazon just to keep track of what I need (or want really). Our favorite Mustela shampoo, a Baltic Amber teething necklace, a soft bibs, Milkies, sound machine, some stroller accessories, and a few other things are on our wishlist. In case you are interested (and want to buy the video monitor as an anniversary present for us! ), here is our baby registry. I know girl clothes are so fun to buy for people and I assume most of the little gifts I will get will be clothing, which I need and don't mind at all! Since we've been home bound for a couple of weeks, I have used that time to do lots of cooking and trying new recipes, it has been a highlight of our sickness plague. I haven't gotten around to photographing any of our meals but know that the ones I am going to share are 100% blog worthy! If only I didn't have a snotty toddler attached to my leg as I was prepping dinner, it would make snapping pictures a lot easier. 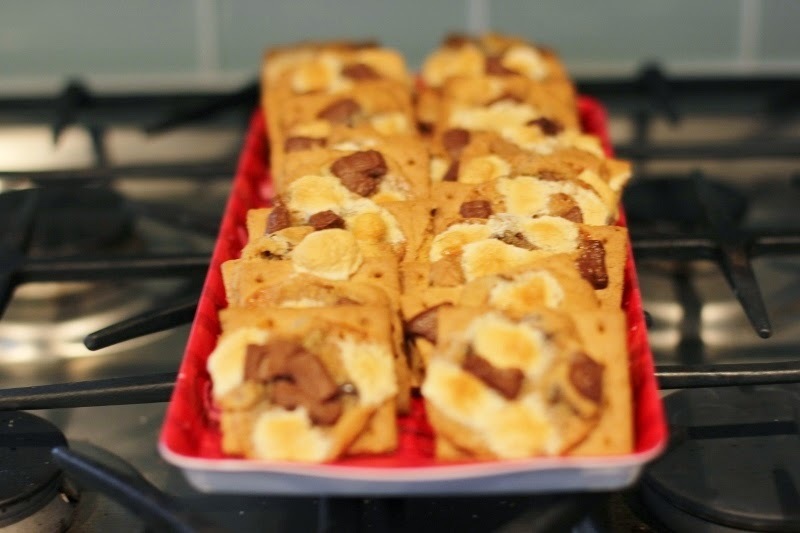 I've had lots of people tell me that they enjoy the recipes I post because they are easy and I love that. I am always sure to check the ingredients and prep time before I even consider a recipe because again, toddlers make dinner prep kind of difficult. I try to spend as little time as possible preparing the most delicious meals for my family. If I can cut veggies a couple hours in advance while Ford has a snack or throw something in the crockpot in the morning, I am good. So here are some of our recent eats! 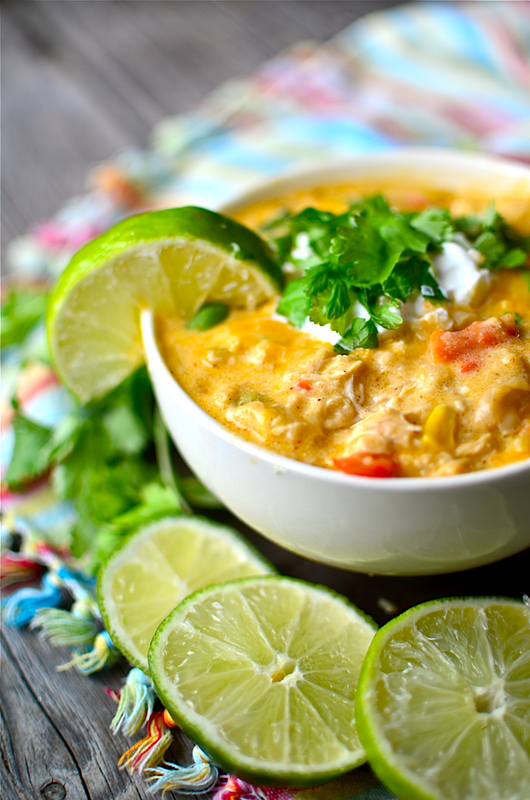 Creamy cheesy white chicken chili- one of those meals that leaves you patting yourself on the back. It is THAT good and makes a delicious winter meal with lots of leftovers. 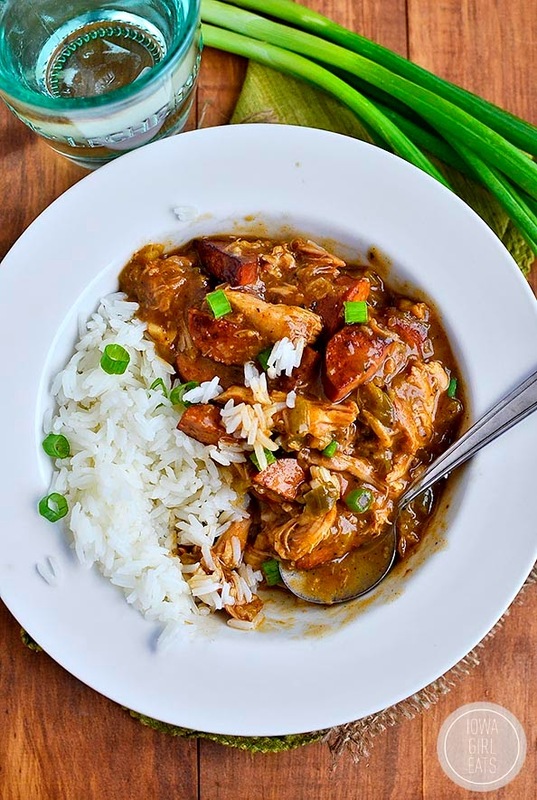 Smoked sausage and chicken gumbo- another winner in our household and we are still eating up the leftovers at lunch. I made it easier on myself and bought precooked sausage and made shredded chicken in the crockpot the day before (and used for 2 recipes). 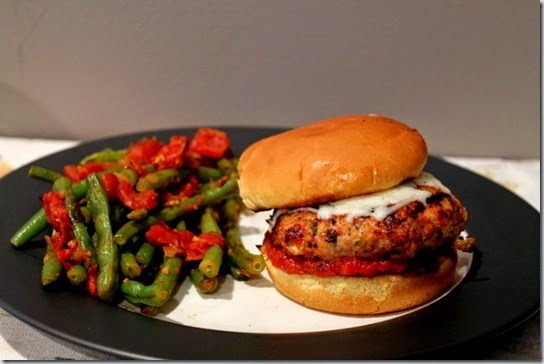 Healthy chicken Parmesan burgers- we made these last night and barely spoke during dinner as we savored every bite. This is huge y'all... Ford even ate an entire burger! I can't wait to dig into one at lunch. We toasted Hawaiian bread buns and made homemade french fries. Mmm. 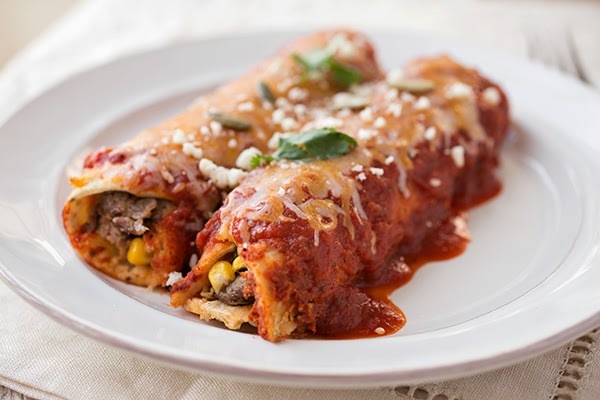 Flank steak and 3 cheese enchiladas- enchiladas are a staple in our house because you can basically throw together whatever you have on hand and create a delicious meal. Ever since our honeymoon a couple years ago to Cabo, we've loved flank steak and finding new ways to use it is always at the top of my recipe hunt. 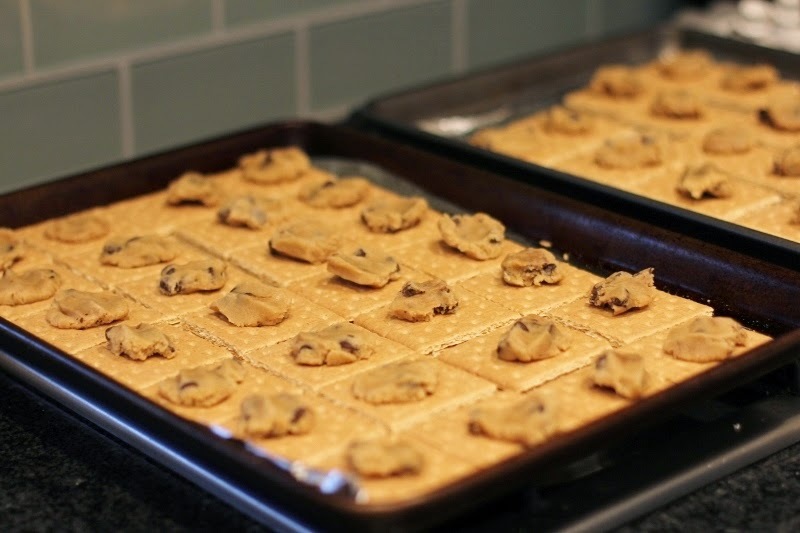 I was able to prep the entire meal in the morning and pop them in the oven at dinner time. 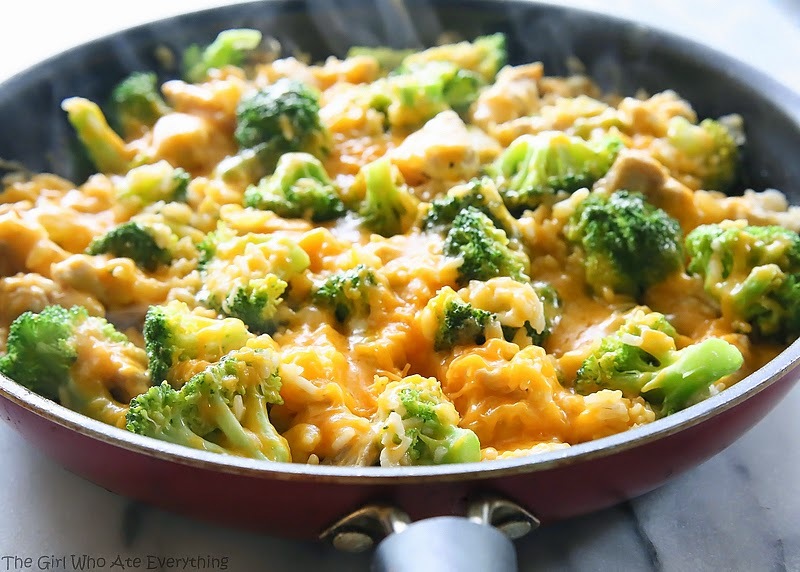 One pan cheesy chicken, broccoli, and cheese- you have probably seen a lot of chicken, broccoli, and cheese bake recipes on Pinterest and the back of soup cans but none has ever been as wonderful as this (and easy!). Dinner was ready in 20 minutes and yummy as ever! 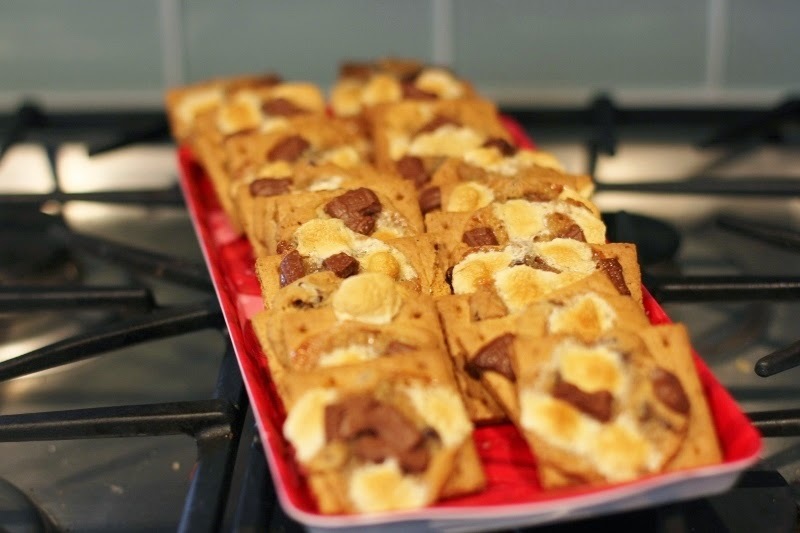 I hope you decide to try a few of these recipes, I promise you will thank me later! We took Ford in for an oxygen test last night and they found an ear infection, ugh. 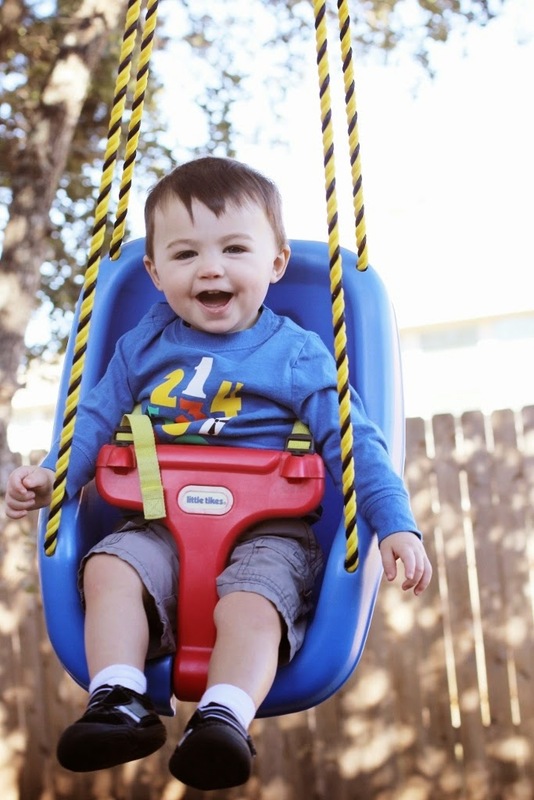 He slept in and seems very happy this morning but we are going to lay low, hang out by the fire, and he'll probably grill me up some yummy food on his new Little Tikes grill. He loves food just like his mama!